Welcome the Muppets back to solid ground in their latest adventure from the Henson creative team. This time around Gonzo is feeling mighty insecure about being a one-of-a-kind guy. His big snoot is practically vibrating with trepidation after a dream about Noah and some Ouija board magic with his breakfast serial. Miss Piggy gets into the act grabbing the microphone away from television personality Shelly Snipes (Andie MacDowell) to cover the Gonzo story. A space agency is monitoring messages from space. They suspect there may be an alien spy making contact with dangerous space confederates. They trace their suspicions to Gonzo, who indeed is the one, but is he or isn’t he an alien. You’ll have to rendezvous with the big space ship along with Gonzo and the Muppet crew to find out. The plot provides lots of opportunities for good Muppet fun and the direction by Tim Hill is crisp. The puppetry is as always quite wonderful. I can’t say that the musical number gave me the kind of lift a shot of Muppet energy normally promises. And high power guest star appearances have also diminished in impact in Muppets from Space. Andie MacDowell smarms her way through Shelly Snipes and Rob Schneider acts officious on the television set. F. Murray Abraham gets his shot at biblical immortality as Noah, Ray Liotta plays a guard, and David Arquette mugs as Dr. Tucker. 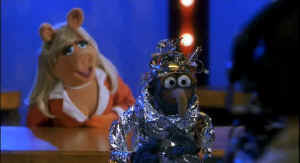 Muppets from Space takes every opportunity for allusions to other Science Fiction movies. Look for references to Close Encounters of the Third Kind, Day the Earth Stood Still and more. Oddly enough, the humor of these moments seems to work with or without knowledge of the original reference. The colorful cross section of Muppet skins and garb make for a delightful DVD. Colors pop out with incredible pizzazz yet they don’t lose their subtlety. Check out Gonzo’s snout for brilliant color detail. The rose-red tones are highlighted by delicate purple fibers creating a magnificent sunset nose Gonzo. Muppets from Space is as sharp a DVD as you’ll ever get with no edge enhancement. The contrast balance is handled very well. There’s plenty of pop in the Dolby Digital 5:1 sound. One lovely kitchen explosion is a perfect example of robust DVD combustion. The bass is tightly controlled starting out in a chamber of air and bursting into the home theater. A DVD of reference quality! For the audio commentary director Tim Hill leads an assortment of Muppet stars through unusually hilarious observations. You may not learn a lot about filmmaking, but you will get another insight into the magic of these characters and the creative team behind them. The special edition includes seven out-takes and five theatrical trailers, including two from Muppets from Space, The Dark Crystal, Labyrinth and The Storyteller. Finally, there’s the "Shining Star" music video.